The uHandy viewing an insect's wing via its microscope. The products aren't exactly mainstream, but Taiwan's local tech industry is trying to innovate in some niche markets, including cat feeding and sperm analysis. Although automatic cat feeders are nothing new, one company has come up with a device that uses facial recognition to determine which pet feline to feed and how much. The CatFi is a product from Zillians and was on display at the Computex trade show this week. It's basically a large automatic feeder built with a video camera. Footage is streamed to a company server that does the recognition. The Taiwanese software firm developed the product after its founder realized that one of his three cats was ill. He had been relying on an automatic feeder, but later discovered that two of the cats had been gobbling up the remaining cat's food, a company spokeswoman said. Other automatic feeders usually rely on a timer to dispense food, but the CatFi is designed to deliver the exact amount, depending on the cat. Once the cat steps on a silver platform attached to the feeder, the feeder activates and begins scanning the cat. Another important feature is that the platform itself also functions as a scale that can weigh the cat. The scale, and other sensors on the product, lets it track a cat's health, and display the data to a mobile app that can be downloaded on iOS or Android. The mobile app will even warn the user if it detects any abnormal activity from the pet. Zillians plans to launch the CatFi during this year's second half, with a price of US$249, and is targeting global markets including the U.S.
Also on display at Computex was the iSperm, a mobile sperm analyzer that attaches to an iPad mini. The company behind the product, Aidmics Biotechnology, sees big potential in the market, said Mavis Hong, its sales manager. The first generation is built for farmers, wanting to analyze the reproductive health of their pigs. 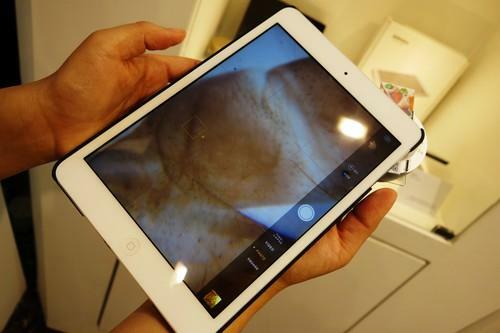 The analyzer is essentially a microscope optical lens that attaches to the iPad's camera. Farmers can take a sample of a pig's sperm, and place it on the microscope. To examine the sperm, the company has developed an app that can offer close-up views, and analyze the sperm's health. In the future, Aidmics wants to upgrade the app with better data analysis, and also expand the product to other animals such as deer, cows and one day humans. The iSperm could help married couples address infertility problems, Hong said. Men may feel less comfortable visiting a doctor, and would rather check their sperm in the privacy of their home, she added. The product is already available and priced at $1,739, which includes an iPad mini. The six-person company has been targeting the Taiwan and U.S. markets, with the aim of expanding into other countries.